Early last month, a devastating car accident took place at one of several toll booths located near St. Cloud. Video footage from the scene of the crash revealed that the driver of a white SUV approached the toll booth without slowing, and while taking out a number of warning cones, before colliding head-on with a cement barrier separating two toll booths. The initial collision caused a passenger to crash through the windshield onto the pavement, landing nearly 60 feet away from the accident site, while the car itself caught on fire. Fortunately, none of the five passengers that were traveling in the SUV were killed, although all suffered injuries. Later, an investigation conducted by the police revealed driver fatigue to be the cause of the collision. In recent years, driver fatigue has proven to be one of the most common causes of car accidents across the state of Florida and the country, leaving thousands of people struggling with painful injuries. Fortunately, at-fault drivers can be held accountable for their actions if their negligence causes serious injuries, so if you were injured in an accident because another driver fell asleep at the wheel, you should contact a car accident lawyer in your area who can help you seek compensation for your medical expenses, property damage, and other accident-related losses. 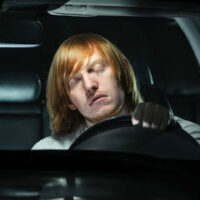 How Prevalent is Drowsy Driving? Fatigued driving, along with speeding and driver distraction, are reportedly the top three causes of car accidents, not only in Florida. In fact, the National Highway Traffic Safety Administration (NHTSA) estimates that fatigued driving is responsible for around 72,000, accidents, 44,000 injuries, and as many as 6,000 deaths every year. A recently published report by the AAA Foundation for Traffic Safety found that drowsy driving may be even more prevalent than these federal estimates suggest. According to the study, as many as 9.5 percent of all car accidents are actually caused by drowsy drivers. These statistics are alarming, as accidents involving drowsy drivers tend to be particularly severe, largely because drivers who fall asleep at the wheel are unable to brake or swerve out of the way prior to a collision. For this reason, drowsy-driving related accidents usually occur at high speeds and so lead to devastating injuries, such as traumatic brain injury, burns, broken bones, and severe lacerations. Commercial drivers, who are often required to drive for long periods of time, are at an especially high risk of fatigued driving. However, anyone who doesn’t get enough sleep, takes certain medications prior to driving, or suffers from sleep disorders could fall prey to fatigued driving. If you were injured in an accident that was caused by a driver who fell asleep at the wheel, please call 954-566-9919 to speak with one of the dedicated car accident lawyers at Boone & Davis in Fort Lauderdale. We provide initial case evaluations for free, so please don’t hesitate to call or contact us online to learn more about your legal options.